Shelving for Lecture Theatre store rooms. Purchase of DVD player & Monitor for Lecture Theatre Audio/Visual Control Unit. 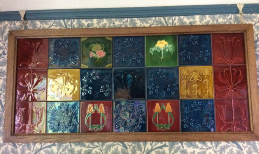 Restoration and mounting of Pilkington Tiles. This is Andy Lendzion, the sculptor who has created our copies of The Discobolus. He is working on his current piece, Odysseus, in his studio in France.